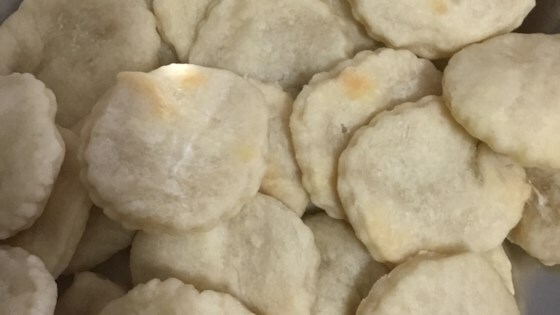 "This recipe has been used for years in our church for Communion bread. Easy to make and stores well in fridge. Watch carefully when baking, ovens vary in time needed." Mix flour, oil, and salt together in a bowl; add water and mix using a pastry cutter until dough is soft. Form dough into 6 balls and press into disks onto the prepared baking sheet using your hands. Bake in the preheated oven until bread is cooked, 8 to 10 minutes. Make authentic Cuban bread for awesome sandwiches! I use a scant 1/3 cup oil and 1/3 cup water. I made this for church according to recipe and everyone loved it! i had a bible study at my house, so i decided to bake these up for my gals. this recipe works great! i really felt gods presence within these tokens of bread.god bless ??! I tried this, but with whole wheat flour, olive oil, coconut oil, garlic powder and thyme! Great recipe, thanks!